Venue: Twickenham Date: Saturday, 15 August Kick-off: 20:00 BST Coverage: Live commentary on BBC Radio 5 live (19:45-22:00), highlights on BBC One (23:45-00:45), repeated Sun 16 Aug, BBC Two, (13:00-14:00), plus live text and radio commentary on the BBC Sport website and app. 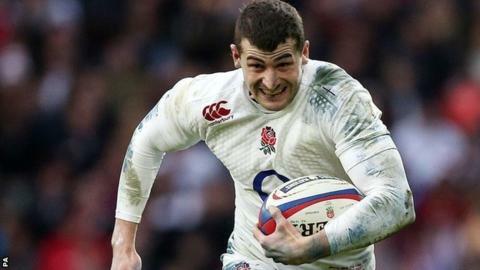 England wing Jonny May says the pain of being dropped during the Six Nations has spurred him on to make an impact before the World Cup. The 25-year-old played in England's first two games in February before losing his place to Jack Nowell. But May has been singled out by England head coach Stuart Lancaster for his fine performance in the training camps. "I was very, very disappointed [to get dropped], and very hard on myself," May told BBC Sport. "But you have two options really; you can just feel sorry for yourself, or get out there and try and put it right." May and Anthony Watson start against France in England's first World Cup warm-up match on Saturday, and along with Nowell are the only wingers left in the 39-man squad. And the Gloucester flier says he is determined to take his opportunity at Twickenham and regain his place in the starting line-up ahead of next month's tournament, which will take place in England and Wales from 18 September to 31 October. "I am desperate to get back in," he added. "I feel like I've worked hard and played some good stuff for Gloucester at the back end of last season, and have come into camp and given it my best. "It's all gone well so far, but I've got to go out on the pitch and nail it. I've got an opportunity this weekend, and I'm looking forward to it." England will field three debutants on Saturday, with flanker Calum Clark and centres Sam Burgess and Henry Slade all winning a first cap. Exeter back Slade says he was inspired to play for England after watching the World Cup winners of 2003. "Since the 2003 World Cup - I think I was 10 - when I watched the drop-goal and saw England win, I have wanted to be part of that," Slade told BBC Sport. "I've been imagining this moment for some time now, and it's awesome it's going to finally come true." And while Burgess and Slade may be competing for one centre spot in the final squad selection, the 22-year-old feels the pair will complement each other well in midfield this weekend. "We've got a blend of different strengths. He's a big lad and is good at getting over the gainline as well as in defence putting the big shots in. "I'm more of a distributor and playmaker, so I think we bring the best of both worlds." Listen to Matt Dawson's Rugby Show on Radio 5 live on Thursday 20:00 for an in-depth look at World Cup preparations in the northern and southern hemisphere.